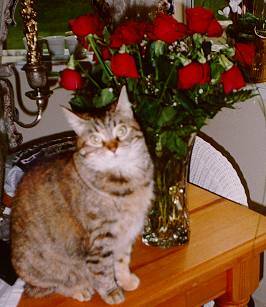 The NHFP also has an affiliate service, The Tatiana Pet Memorial, named in memory of the little tortoise-shell tabby who adopted the Marocchinos on the eve of Nikki’s death but was tragically killed by a vehicle less than a year later. This service was established to offer pet parents information on pet cemeteries and burial-related services in order to help them make the most appropriate decisions in regards to their pets’ final resting-place. The NHFP calls this kind of service "post-hospice care" and considers it a vital part of the overall veterinary hospice experience. When pet parents lose a beloved pet, they are almost always faced with a major decision, that of determining the best destination for the pet’s remains and/or locating and choosing a pet cemetery in their immediate vicinity. Veterinarians are urged to refer their clients to The Tatiana Pet Memorial when such decisions are pending, so they can locate a pet cemetery within a reasonable distance from their homes. With adequate funding in the future, The NHFP hopes to provide burial services for the pets of needy and elderly pet parents who do not have the financial means to cover these costs themselves. Your generous donations and/or annual contributions as friends, supporters, patrons, benefactors and sponsors of The NHFP (fully tax-deductible to the extent allowed by law) will help to make this a reality.